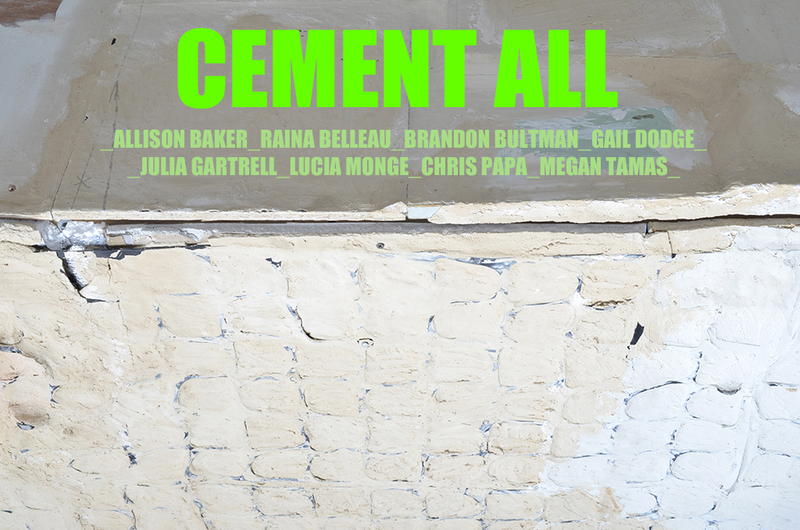 CEMENT ALL brings together eight young artists working in sculpture and video whose works demonstrate a set of approaches querying the status of objects and their (and by association our) impacts on the larger ecosphere. Each artist in the exhibition takes a unique approach to securing and destabilizing objects, materials, and meanings in works that at times solicit our shame, poke fun at our hubris, or withdraw from us, aloof and implacable. The title names a tendency to reify in order to re-animate—a dialectic that exists in the world capturing our efforts to think and put into action any positive effort to quell nature’s turn against the human (a formulation that itself exhibits a reifying-ironizing tendency towards ‘nature’ and ‘the human’). Cement All is also the trademarked name of a popular cement product that inadvertently points towards the (modernist?) dream of architects, home owners, and pragmatic philosophers alike, to construct a concrete world, a stable life, with clear boundaries and fixed identities. It is a fitting title to parallel the ethos and history named by the Flux Factory. The exhibition program includes an evening of readings at Flux Factory organized by the poet Christine Kelly, which runs in parallel with the exhibition. Allison Baker, Raina Belleau, Brandon Bultman, Gail Dodge, Julia Gartrell, Lucia Monge, Chris Papa, Megan Tamas. Dates: October 2 – 21 Locations: Flux Factory and throughout NYC Check out all of our Congress of Collectives events this October–hosted by Flux Factory, Creative Time, Union Docs, and Nurture Art–compiled into one handy page. The events are free and open to the public.